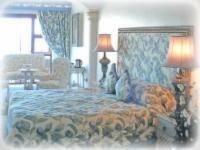 Accommodation at Misty Waves offers absolute luxury, comfort and tranquillity, as well as 5 Star service. Our luxury sea-facing suites and unique conference facilities are located in the heart of Hermanus, just metres away from the famous cliff paths, renowned for the best land based whale watching in the world. 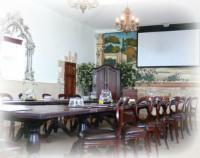 The hotel also boasts an impressive wedding facility with quaint chapel and a honeymoon to dream of. We are conveniently located just a minute's walk from the village centre, craft markets, and restaurants, and even offer a chauffeur service to surrounding golf clubs. Linger in the lounge area with fireplace, enjoy sumptuous breakfasts in the adorable dining area, or indulge in a romantic in-house candle lit dinner overlooking Walker Bay. Our friendly staff will also be happy to arrange activities such as whale watching, shark cage diving, and safaris. Ground Floor - Honeymoon - Partial Sea Sleeps 2 Includes: B & B Rooms / Units: 2 King-size four poster bed, bathroom with corner spa bath, lounge area and private patio, with partial sea views. Gold Superior Honeymoon (502) Sleeps 2 Includes: B & B King Size Bed. Open plan Bathroom with bath and Double Shower. Balcony. Amazing Sea Views! Loved the garden and the view and the cliff top walks. We really had a lovely time. The rooms were clean and what a lovely surprise the champagne, roses and special plate with nice goodies was for our anniversary. Even though it was stormy weather, we enjoyed ourselves tremendously and bonded as a family. The food was superb. We cannot wait to visit you again a year from now, hopefully sooner. Very good location and view to see the whales. The hotel is clean and very nice. Misty Waves Boutique Hotel is 0.4km from the centre of Hermanus , the nearest airport 87km (Cape Town International Airport).